Chicken wings are one of my favorite fried foods, and air fried wings are the best. 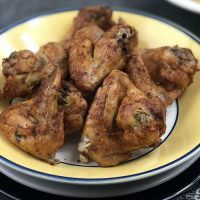 These Keto Air Fryer Chicken Wings are a healthier version of my favorite fried chicken recipe. Wings that are breaded and deep fried are full of fat and calories. I am currently following the keto lifestyle and my air fryer comes in handy anytime I have to cook 2 separate meals. And you don’t even miss the breading! 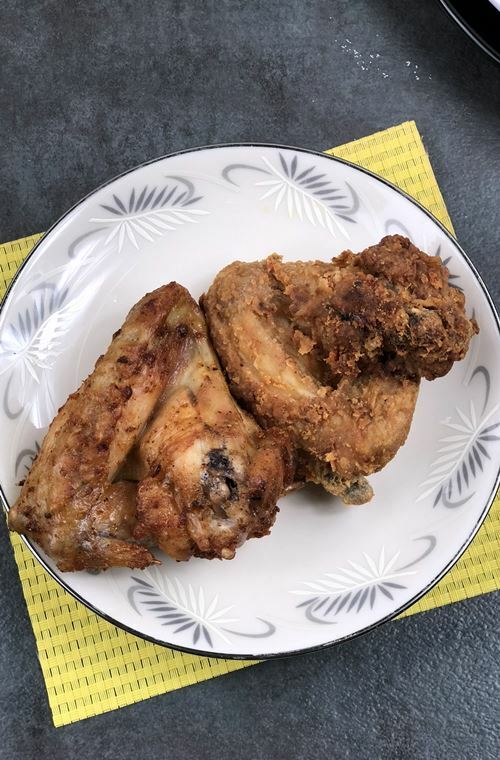 There are tons of keto air fryer chicken recipes, but this is one of the easiest and the best! The breading and oil aren’t part of a healthy diet, but luckily with these keto air fryer chicken wings, you can get rid of all the parts of chicken wings that are bad for you! These delicious wings are cooked without oil in the air fryer and don’t have breading either! Instead, you get a yummy, juicy chicken wing full of flavor without the breading and the carbs that come with it. And unless you want them extra crispy they are done in 20 minutes! 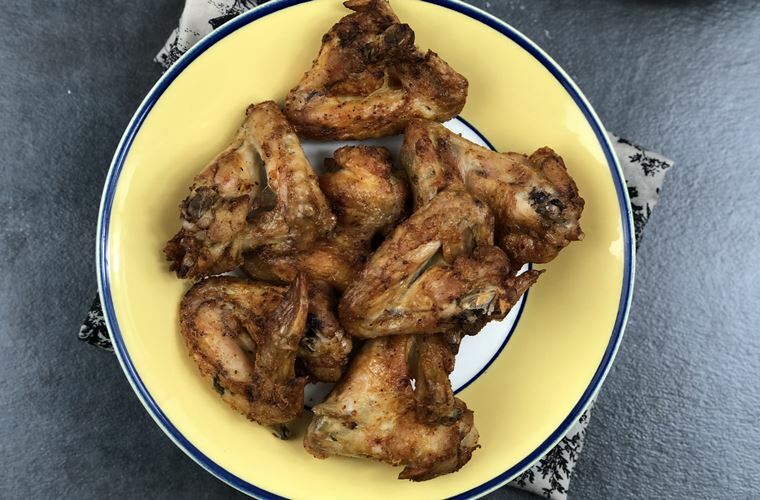 What makes these keto air fryer chicken wings perfect for someone on the ketogenic diet because these wings are carb-free, high in protein, and naturally higher in fat than other parts of the chicken. And you can serve them up with some buffalo sauce, and blue cheese or ranch and still be where you need to be as far as your carb counts. What is the keto diet: It is a low carb, high fat, and moderate protein diet that helps the put your body into a metabolic state called ketosis. In this state, your liver will produce ketones that work as a source of energy for your body by breaking down fat in your liver. When you’re on a keto diet, you typically avoid wheat, starch, sugars, and sugary fruit, but some berries are ok – which means deep frying, breaded chicken wings are a big no-no. But air fried wings without breading are a great option for the keto diet. But why should you cook them in the air fryer? Fat is perfectly fine on the keto diet, isn’t it? It is, but why take the extra time and make a big mess frying these wings in oil when you can make them in your air fryer? 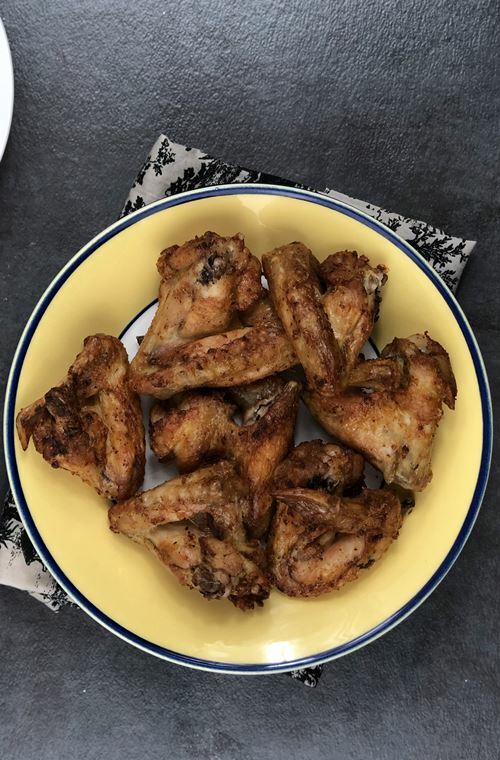 Cooking these keto air fryer chicken wings in the air fryer takes less time than frying them in oil, and you don’t have to discard the oil and clean a greasy pan when you’re finished. I don’t know about you, but I like the avoid doing extra dishes any chance I get! Not only are these keto air fryer chicken wings awesome for someone on the keto diet, but they’re great for anyone watching their carbs and calories. Without the breading, this tasty meal is very low in carbohydrates. Air frying them also makes them a more heart healthy recipe. 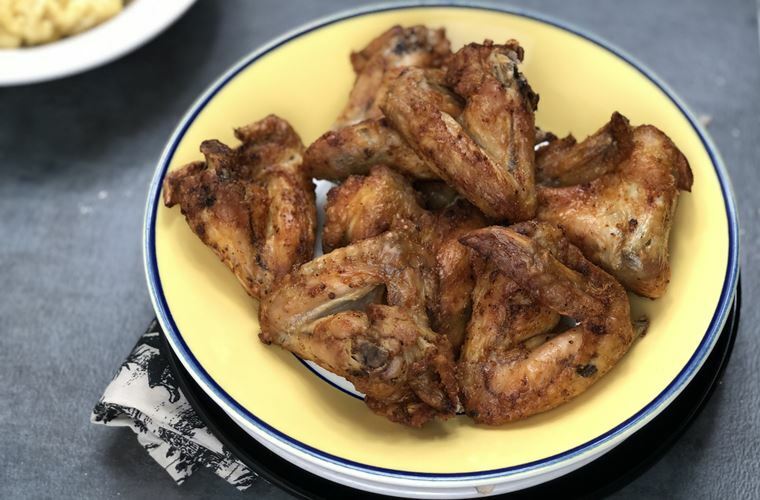 I know I’ve spent a lot of time talking about how these keto air fryer chicken wings are awesome for someone who’s watching what they eat, but I also have to tell you how amazing they taste! Once you make these yummy wings, you probably won’t even want to go back to making wings the traditional way. The air fryer makes the skin perfectly crunchy – just like they were fried in oil – while also keeping the meat inside perfectly tender and juicy. I have the smaller power fryer XL so it is also perfect for single meals. All you really have to do is season them and place the chicken wings in your air fryer basket. But when they are served you can not forget the hot sauce, you could easily toss them in a mixture of hot sauce and butter and drop them back into your air fryer for about 2 minutes each side and have the most amazing hot wings, and still be way low on your carbs. 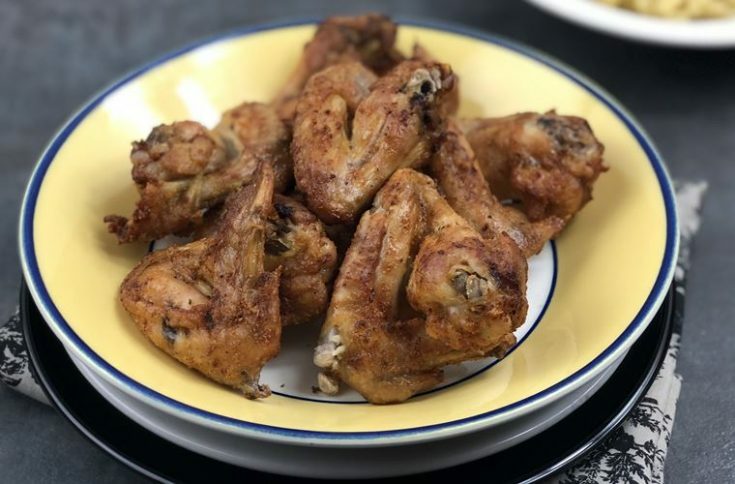 You know you want to make these awesome keto air fryer chicken wings for dinner tonight! Go ahead – scroll down to read the full recipe and see how amazing these wings are for yourself. Just so you can see that visually they don’t look real different. The wing on your right is breaded and the left wing is not. Make sure tou check out these great recipes too Copycat Air Fryer Chick-fil-A Nuggets, 26 Air Fryer Recipes To Help You Learn This Magical Gadget, Air Fryer Strawberry Banana Bread Recipe. Chicken wings are one of my favorite fried foods, and air fried wings are the best. 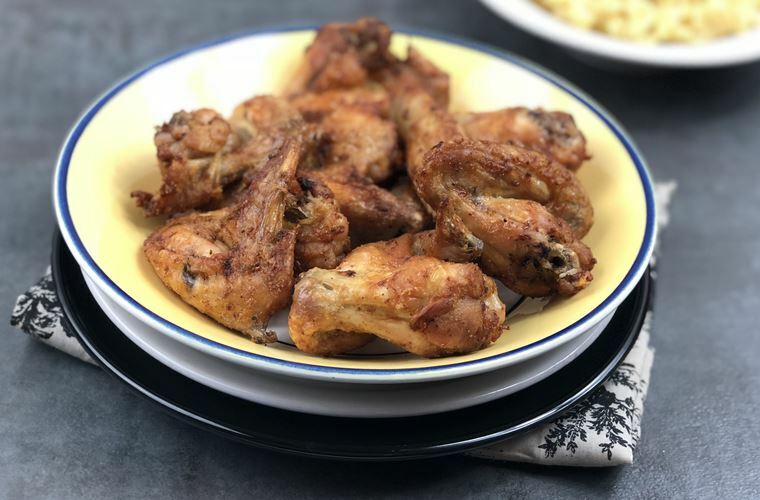 These Keto Air Fryer Chicken Wings are a healthier version of my favorite fried chicken recipe. How do you flip something constantly in an air fryer?…. Open and flip, time stops on mine when you open.